During pomegranate season, these sweet-tart seeds go into many many salads for both color and flavor. Before local lettuces start appearing, I go searching for other interesting greens. 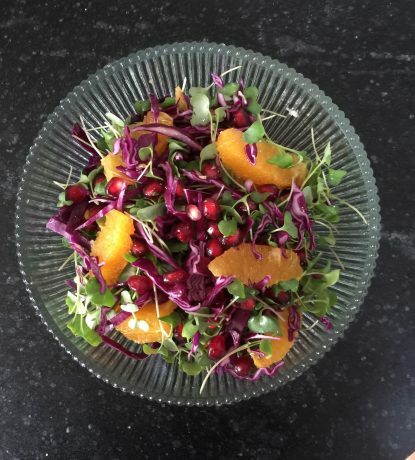 My current favorite is microgreens – especially the broccoli or arugula microgreens. Delicate and tender, they are still packed with green nutrition. Microgreens are usually available at Whole Foods. A number of Vineyard growers now have them as well, including Morning Glory Farm, The Hub at Thimble Farm (sold in Cronig’s) and Mermaid Farm. Check them out! Open the pomegranate in the bowl you will be serving the salad in. Remove any bad seeds or white pith. Cut orange into segments between the pith and add (save any juices for the dressing) . Thinly slice – razor thin – the red cabbage. Finally, add the dried cranberries and micro broccoli or arugula and gently mix in. Make the dressing, by whisking together the orange juice, lemon, vinegar, olive oil and salt. Dress the salad just before serving. Enjoy!